Many new parents worry that having a cat in the household will pose a big threat to the safety of their baby, and this fear can even result in parting company with their cat altogether. This concern is now thought to be nothing more than a myth, with most experts stressing that cats and babies can definitely live together – as long as certain precautions are taken. You may be concerned that your cat could harm your baby’s health by passing on diseases but this is actually quite rare. Cats rarely pass diseases onto humans, with the exception of toxoplasmosis. If your cat experiences an infestation of this parasite, he or she will shed infected faeces. Humans (and other animals) can then become ill via this. For the most part, this will only result in mild symptoms but it can be much more serious for pregnant women. Worst-case scenarios include miscarriage, stillbirth and birth defects. For this reason, it’s advisable to not be the one to clean the litter tray while pregnant to minimise the risk to your unborn baby, or to use rubber gloves if you can’t avoid doing so. Expect your cat to be confused and at least slightly jealous of the newcomer. It’s natural to focus your attention on your baby but don’t neglect your cat too much. Try to give him or her daily attention and watch out for signs of anxiety and distress, such as inappropriate urination and/or defecation, hiding, aggressive behaviour and lack of appetite. It can also be a good idea to set up a quiet “safe” room for your cat to venture into to escape, especially if you have guests popping round to meet the new arrival. Before the baby comes home, prepare your cat for the new situation by exposing him or her to baby-related smells and sounds. This will make things less traumatic for the initial introduction. During the introduction, use praise, treats and encouragement to teach your cat that the baby is not to be feared. This will help your cat to form a positive association with regards to the baby. Be prepared for some distress on one or both sides, in which case the introduction should be ended and repeated again at a later date. 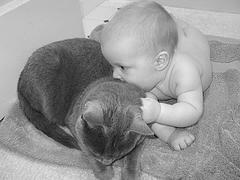 Cats and babies do not necessarily need to be kept apart but interaction should be supervised at all times. Your cat should be prevented from sleeping next to your baby. To prevent your cat from being able to get into the baby’s crib, you can place a net over it. Make sure that your cat’s litter tray and food bowls are out of reach, especially as your baby learns to crawl. A safety gate can act as an effective barrier to prevent access to these areas. Don’t stray away from your cat’s usual routine for feeding, grooming and playtime as this can cause further distress. To ease your cat’s stress, you may want to try using a Feliway diffuser to create a more calming and relaxing environment or 2ylkene. Did you live with a cat when you were small or have you successfully brought up a child in a household that also features cats? What have your experiences been with cats and babies? Share your thoughts in the comments section below!